360 degree feedback is one of the most reliable tools for accurately and objectively measuring leadership effectiveness. It typically includes obtaining anonymous feedback from a manager’s direct reports, peers, customers and their boss. We have identified four fundamental areas (communication, leadership, trust, and conflict) that are critical to individual employee and team performance based on our research of over 20,000 supervisors, managers, directors, and executives from corporations, non-profits, government agencies, colleges and universities. 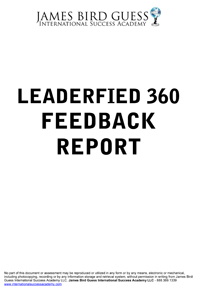 The Leaderfied 360 assessment was developed to measure the health of teams for supervisors, managers and senior level business leaders, to ensure employees are engaged to deliver their best performance. Leaderfied will also determine if managers and leaders are “highly effective,” “average,” or “ineffective” when leading their teams and diagnose potential areas for training and improvement. Call us now at 888.369.1339 or email info@internationalsuccessacademy.com to learn more!